One of the main challenges Alex faces in the loft is the odd shape and size of the upstairs master bedroom. His first step in de-emphasizing the oddness of the room is perfectly positioning the bed. Placing it against the middle of the back wall with the footboard expanding into the room takes the focus away from the odd angles and places the emphasis back on the loft’s spaciousness. This bed location also allows Alex to have enough space for two bedside tables and connects the bed to the high windows and ceiling. In episode 2, Alex achieved the same effect in the living room by placing the sofa against the wall and opening it to the room’s expanse. Positioning a sofa to face the wall (or TV) makes a room feel closed off and small. Another consideration for our oddly shaped bedroom is the scale of the furniture. This is really true for any room in any house. Because of the low ceiling in the bedroom, he selected a bed with a mattress that is no more than 24 inches off the ground. Anything higher, just won’t feel right. Another key to decorating a bedroom with an open floor plan is creating an illusion of privacy in a vast space. Positioning the headboard on the back wall creates a private space away from the main living area. At the same time, the view from the bed will emphasize the openness of the space and the access to the outdoors. 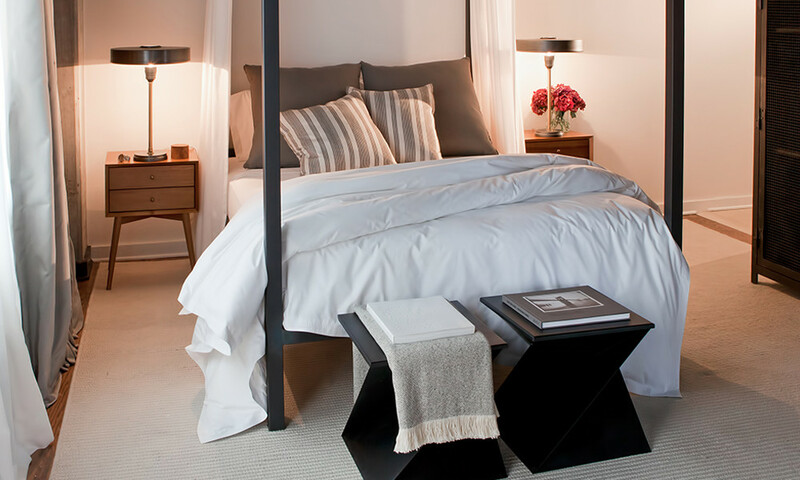 Of course, we think the defining detail for the bedroom will be the bed draperies made Sunbrella sheer fabric, guaranteed to add a sense of privacy. Designing odd shaped rooms is challenging. But, if you consider how it relates to the design of the overall space, then it won’t feel awkward anymore.